Well, one way or another, you’ve found yourself on the home page of the website for Martyn Bedford – award-winning author of novels and short stories for adults and young adults and creative writing tutor. If you meant to be here, welcome … if not, you’ve probably already navigated away. My third novel for teenagers and young adults, Twenty Questions for Gloria, was published in 2016 in the UK, America and Canada, with translated editions in Germany, Italy, Spain, France and the Netherlands. It was nominated for the 2017 CILIP Carnegie Medal, was selected for The Guardian‘s Best New Children’s Books Guide for 2016, won the 13+ category in the Coventry Inspiration Book Awards and was a top-three YA download on lovereading4kids. Sneak preview . . . to hear me read an exclusive extract please scroll to the link on the Teenage Novels page. “The set-up is thriller-like but what’s impressive about this story is its realism. What looks like an endorsement of thoughtless rebellion becomes something deeper. Yet under it all is a golden thread of romance.” – Suzi Feay, Financial Times. “An amazing novel.” – The Guardian. “This whole story is emotionally perceptive and impeccably written. It deserves to be read.” – Books for Keeps. My second teenage novel, , was published in 2014 in the UK, the U.S. and Canada, with translated editions in Germany and Poland. It was nominated for the 2015 CILIP Carnegie Medal and received prestigious starred reviews in America from Kirkus and Booklist and favourable, high-profile reviews in the UK from The Guardian, The Observer, Metro and The Literary Review. It was also a Book of the Month on lovereading4kids. My first novel for teenagers, , was published in Britain, the U.S. and nine other countries. In the UK, it was shortlisted for the Costa Children’s Book Award, longlisted for the Carnegie Medal and named as a Red House Children’s Book Awards Pick of the Year title, as well as winning four regional prizes: the Sheffield Children’s Book Award, the Calderdale Book of the Year Award, the Bay Book Award and the Immanuel College Book Award. “Bedford’s taut style and psychological insight make Flip a gripping thriller.” – Amanda Craig, The Times. I’m also the author of five novels for adults which, between them, have been translated into thirteen languages – Acts of Revision; Exit, Orange & Red; The Houdini Girl; Black Cat and The Island of Lost Souls – in addition to numerous short stories, three of which are free to read on this site by following the links on the Short Stories page. 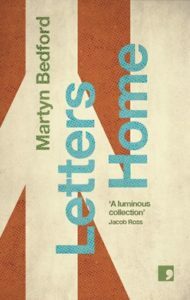 In November 2017 my first solo collection of short fiction, Letters Home, was published by Comma Press, comprising stories that span my career in writing. I teach on the English undergraduate programmes and Creative Writing MA at Leeds Trinity University and have been running workshops and writing courses in schools, colleges, libraries, bookshops and for community groups since 1999. Most of what you need to know about me and my work is here. And there’s a blog, as well, where I’ll be posting news and events and sounding off about things that interest me (and hopefully you too). Martyn Bedford is the genuine article, a writer of unmistakable flair and accomplishment.